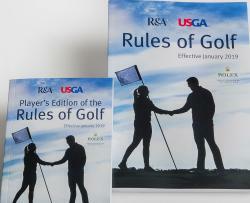 LIBERTY CORNER, N.J. (February 2, 2019) - Following an ongoing dialogue with players and in cooperation with the PGA TOUR rules team, the USGA and The R&A revisited the penalty assessed to Denny McCarthy during round 2 of the Waste Management Phoenix Open. After an additional review of available video this morning, it was determined that the penalty would not apply in this instance nor in a similar instance involving Justin Thomas. In each of these cases, when the caddie was standing behind the player, the player had not yet begun taking the stance for the stroke, nor could useful guidance on aiming be given because the player was still in the process of determining how to play the stroke. The same would be true for any similar situation that might occur.